This page was written for Mint Linux 14 (Cinnamon). It should apply equally to Ubuntu distributions around the 12 era. This guide is opposed to installing the standard suggested virtual-machine solution. The Contiki Wiki has some very valuable information and is worth a look. The first thing to do is to start downloading Contiki. The Contiki-OS Download Page has a link to download Contiki source code. At the time of writing, Contiki2.6 was the latest. Direct link here (25MB). 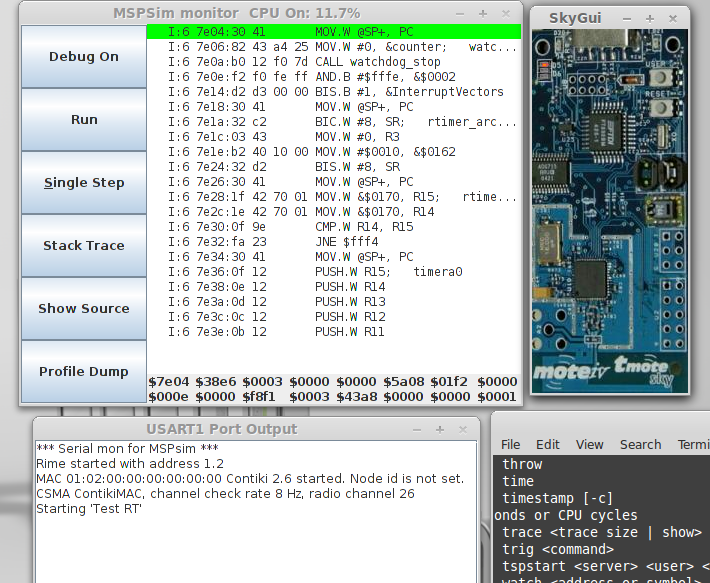 The next thing to do is to install the MSP430 toolchain. If you’re running a newer Linux distribution which has these packages then you’re in for a quick and easy ride. See here for more information. If you get something similar, then you’re ready to roll! You’ll get lots of output from the compiler. Once it’s finished, you should have a file called rt-leds.sky. If so, then you’ve won! We’ll test the Cooja simulator too. My Contiki Cooja Simulator page has much more about Cooja on it. 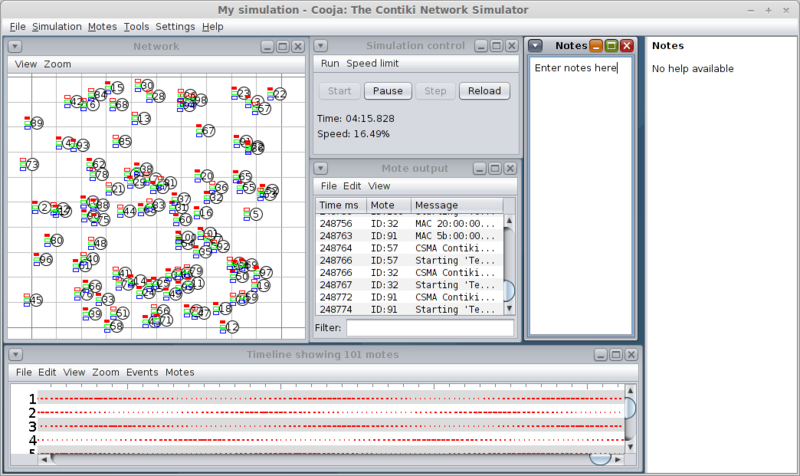 This offers simulation of a single node’s hardware, in contrast to Cooja’s network style simulation. This error is solved by editing contiki/cpu/msp40/Makefile.msp430 and removing the -g option from line 132, as described here. This page just provides a few links and tips for anyone looking to get started with Contiki. Firstly, Contiki provides an instant environment which can be booted with a virtual machine and used. 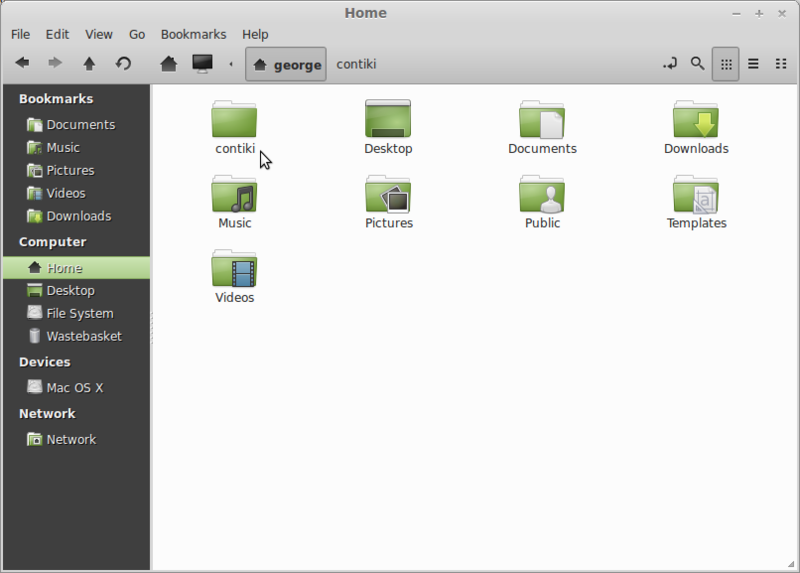 I wanted to have my environment run natively so I set about trying to work it out using Ubuntu. This process describes Ubuntu 10.04.3 LTS.